It is Cinco de Mayo weekend and time for a fiesta! For me, Cinco started last week when I was on two morning news shows promoting Mrs. Wages salsa, guacamole, and queso dip. What fun! This one is my favorite! Tim Ezell and April were a hoot! Elliot politely refused my sombrero but it didn’t stop me from having a blast! For my own Cinco celebration at home with friends, I wanted to do something special after the tortilla chip crumbs were brushed away—so, for dessert, I served Ibarra Mexican Chocolate Sauce over vanilla bean ice cream! Ten years ago I went with my husband to a conference in San Diego. We stayed at a hotel that overlooked the bay and had a view of Coronado Island. At the time, my boys were little, 2 and 5, and my girl was not yet on the horizon. It was the first time I was getting on a plane to go somewhere without my kids. It was just two years after 9/11 and getting on a plane was still a little anxiety provoking, to say the least. The third Lord of the Rings movie had just come out in theaters, and I was almost done reading Return of the King, rushing to finish before seeing it in the theater, which we planned to do on New Year’s Eve on our trip. We lived in a small town at the time, Winona, Minnesota, and the New Yorker in me was desperate to go to a city, any city, and eat great food and be around hoards of people. So off we went. It was an icy December, and getting on a tiny propeller plane from La Crosse, Wisconsin, to the Twin Cities was no comfort as it shook and shivered to get off of the ground. I watched the blinding whiteness of snowy Minnesota disappear as we headed to what I hoped was a lush, green California. When we got to San Diego we were told they were having the coldest winter in recent history. I pulled my coat tightly around me and braced myself for the chilly California weather and an exciting week without my two loves I had left far behind at home. Return of the King weighed heavily on my mind—I fretted as I read. Frodo had risked everything to travel far and away and save Middle Earth. Surely I could make it through the week without going to pieces over missing my boys. Frodo and I, we were in this together. On December 31 we took the bright red trolley to Old Town. A couple of stops further and we would have been in Tijuana. I wouldn’t have dared to travel over any borders with my kids so far behind, so Old Town was as far as we went. We spent a very enjoyable day browsing ceramic lizards and other hand painted pottery in the Mexican art galleries. We ate delicious Mexican food and drank wide and wobbly glassfulls of margaritas rimmed in salt with clinking cubes of ice. We sat outside under a chilly sky with brightly colored restaurant décor and lively music playing all around us. That night we would ring in the New Year by sitting through a late showing of Return of the King, too excited to do anything else. But first we would shop at a the Mexican stores—our Minnesota house was too tiny for more art, but the grocery store was pure delight. 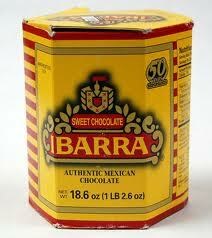 One of the things I purchased that day was a large box of Ibarra chocolate with plans to make hot cocoa as soon as we returned home from our trip. It was something I could share with my boys from our trip that would warm us up together from the harsh Minnesota cold. I kept the bag of Ibarra on my lap during the movie that night, and clutched it tightly as I watched Frodo destroy the ring and restore balance to his world. We would go home the next day. Home was filled with hugs and kisses and joy and cups of hot Mexican cocoa. All of these years later I rediscovered the yellow box of Ibarra, 5 more paper-wrapped discs waiting patiently to be transformed into more cocoa. 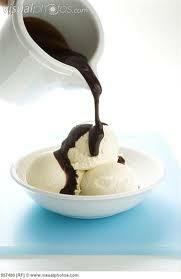 But instead I made something much, much better: Mexican Chocolate Sauce. On our table I put out the sombreros from my TV cooking demo from earlier in the day. I hung the paper Mexican flags from our window and made bowls of queso, salsa, and guacamole. We had our Cinco de Mayo dinner with friends, and for dessert, little white bowls of vanilla ice cream topped with warm Ibarra chocolate sauce: the flavor rich and spicy; the texture enhanced by the slight sugary crunch and the subtle hint of cinnamon; the chocolate flavor deepened by a splash of Kahlua and silky cream. 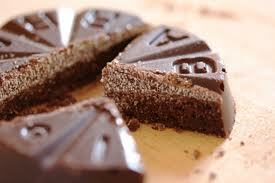 Place the chocolate and the cream in a microwave safe glass bowl. Microwave it for 1 minute, stir, and microwave it for another minute. 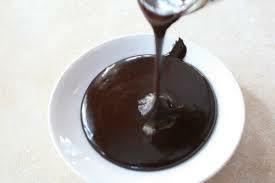 Continue to heat in 20 second increments, stirring each time until the cream is very warm and the chocolate begins to melt. Let stand for a few minutes and stir until smooth. Let cool to room temp and serve over vanilla ice cream. This entry was posted in Dessert, Holidays and tagged Cinco de Mayo, dessert, Ibarra, Ice Cream with Mexican Chocolate Sauce by pomegranatesandhoney. Bookmark the permalink. sounds so yummy!!! loved this post! I will personally attest to the fact that this is DELICIOUS!! Wishing I had smuggled home a container of it! Great recipe, great story, Great memories. Thanks mom— feel the same way!